In May 2008, Andreas Ludwig and I used a prolonged weekend to visit the Bridge of Remagen. Recently, it has awoken to a modern combat. However, because I do not have a lot of modern war games too much, the environment that can be played is not in order. The game owned now is Assult,FireFight,6th Fleet,2nd Fleet,TaskForce,FirePower,Air Auperiority,The Speed of Heat,MechWar'90(HJ),CombinedArms(Tsukuda),FlightLeader,Patton(Tsukuda),Jetfighter(Tsukuda). Looking for can play is a difficult situation though it is possible to play almost. Quite busy. TWO Car accidents: my wife (not major, only a rear bumper to replace) and my step-daughter (her van -which we co-signed for- utterly demolished; she is not hurt, at all, fortunately,). I am now 2nd Vice-Commander for my American Legion Post. Always a nice feeling, winning elections. This wwI game by Ted Raiced attract me time ago for his map with big hexes. When finally I grab at sale a copy from GMT online store I laid the map in my table waiting patiently to find a pbem opponent to try it. Finally, my friend Pierre Miranda accepted my challengue and we are going to start with the historical scenario setup where I will try to get into Paris with the Germans. I am using a streamlined version of the classic Operation Typhoon/Victory in the West system. This involves a chit pull for most units to determine strength upon entering combat. Each player turn has a move-fight-reserves-mech move-fight structure with the Germans being able to attack with everybody twice a turn. I had a nice afternoon, today. I got to teach some of the basics in Machine Gun tactics. 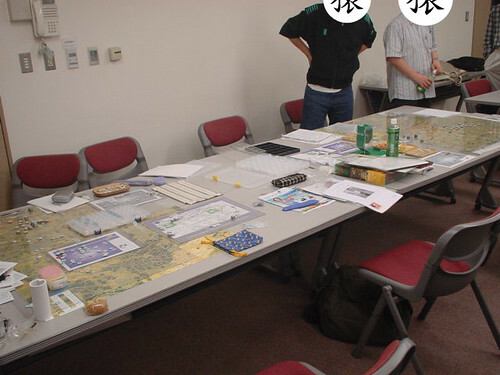 Five GCACW players gathered at EN YU KAI, an annual wargame convention in Tokyo, on April 26 and 27. There is many web sites in the net available for pbem players where you download modules, look for opponents, and so on. But this sites are like many others you could have available if you like computer games, have a pet, and so on. There is one type of sites I guess you only found if you are an adict pbem player: the ladders. In the Era of Cyberboard 2.0, when the pallete has only 256 colours available, Cyberboard designers made his gamebox maps using the drawing tools provided by CBDesign. You had to spend many hours of your free time if you want to get the virtual map with the same quality than the printed map. Of course, many designers did gameboxes with simple but useful maps that allows you play the game (and I will try to show in a future post a example of this). Formerly known as GTL Text Editor (his name was his main feature then), this windows application created by Jeff Fisher allows edit gtl files exported with CBDesign (or created with Bill's Cyberboard Utilities as I commented in a previous blog post). The dot gtl files contains in a internal format used by Cyberboard three bitmap image of each tile: full, half and small size. One of the finests aid to pbem is the Automated Card Tracking System, developed by Kurt Kuhlmann as a web application to support the Avalon Hill's Card Driven Game We the People at the end of last century. It has been expanded during this time, slowly but continuosly, and now it has 24 differents modules, one of them is a generic module that allows you use this service with virtually any board game.